Magnetic die-cut classroom and work organizers. 4 large pieces (5.5" tall) on a 8.5"x11" standard sheet. 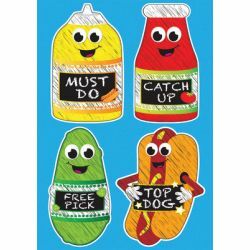 Let them know what work they need to "Catchup", "Must Do", "Free Pick" if they are already done, and who's the "Top Dog".